Yay! Before the frost sets in, look what was on the plants... And now rescued! I see lots of salsa. Mmmm! Now, where's me fretless and the ashbory. Have a rap track to work on. I've never really seen this latest of our great British tradition of camp humourists before, but I just caught a few minutes of his show on BBC1. Bit tragic. I thought mercilessly taking the pee out of that slightly mentally fragile bint off x-factor last year who has "White horses" out on single was last years' tired character assassination based humour? Seriously though, is this guy actually gay? Gay people are often naturally funny I reckon. The audience sound like they've been beaten around the head with applause cards. It's like listening to a giggling bath tap. November. 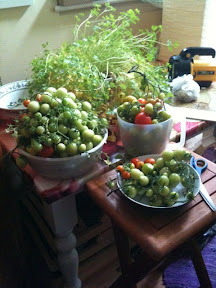 And it's tomato harvesting time, still. Madness. But they are perhaps the hardiest tomatoes we've ever grown. They are just leaning against the house, user the deep eaves we have, and they get a fair amount of sun. Weather looks okish this week. I reckon well still be cropping next week. Got to love growing your own. Next year hopefully we'll get our patch up the hill working. Currenty it's all brambles! Incidentally, anyone want to buy a green Xantia? I just got another one and I think I should at least pare it down to one. I just turned off nearly all the email stuff facebook sends you, and turned on the SMS notify stuff, but only for messages, not wall posts, etc. Apart from the annoyance having to look through about a million emails with one damn comment each, it was filling one of my inboxes with utter junk, making it hard to find actual messages. Why can't facebook do a daily digest with it all in? It's a bit academic anyway. Since I got this phone I tend to check facebook when I've got a free minute, and the support on it is great, so you soon catch up. Anyone out here use Twitter? It sounds like a great place to meet up and discuss topics with other near-psychotic disillusioned thirtysomethings. Nothing political. I have decided to take time out from playing live. All the recent stuff with stress has forced me to confront some ideas I have cast into stone, and question them properly to find out if they are as important as I think they are. Recent advances on t'web mean I can collaborate far more easily with people, and the studio has had its' recent makeover. My inability to find time to practise and write properly within a band setting became another source of stress rather than the glorious experience it should be, so I'll be working solo and collab for now. Hopefully this will mean more output. I hope so, this is an experiment.